Martin WIEMERS (1998) wies durch Allozymelektrophorese nach, dass die Taxa C. gardetta und C. darwiniana genetisch nicht gut voneinander differenziert sind, und dass sich beide Taxa gemeinsam fortpflanzen können, so dass sie als konspezifisch anzusehen sind. Zum gleichen Ergebnis kamen kurz zuvor auch PORTER, SCHNEIDER & PRICE (1995). Außerdem weist WIEMERS (1998) auf Gebiete hin, in denen C. arcania und C. gardetta hybridisieren, und bezeichnet letztere beiden Taxa als Semispezies. Auf der Basis von sehr viel mehr Individuen von mehr Orten, vor allem aber mit einer verfeinerten Methode der Allozymelektrophorese relativierten SCHMITT & BESOLD (2010) den Grad der aktuellen Hybridisierung. Sie kamen zum Schluss, dass sich C. darwiniana und C. gardetta ganz klar auf Artniveau trennen lassen, auch wenn C. darwiniana einst durch Hybridisierung von Tieren aus der C. gardetta-Linie mit solchen der C. arcania-Linie hervorgegangen sein könnten. 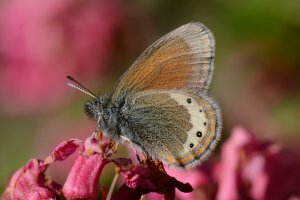 SCHMITT & BESOLD (2010) kamen in ihrer umfangreichen Studie auf der Basis von Allozym-Elektrophorese zum Schluss, dass der Artenkomplex um Coenonympha arcania und C. gardetta in den Alpen nicht aus zwei oder drei, sondern aus vier Arten besteht, zwischen denen es teilweise zwar Hinweise auf (teilweise noch aktuelle) Hybridisierungen gibt, diese die Artgrenzen aber nicht verwischen. Sie schließen aus ihren Ergebnissen: "The four taxa analysed of the C. arcania species complex can be genetically discriminated at an individual as well as at a population level. This classification was supported by neighbor-joining clustering in combination with equal genetic distances, STRUCTURE analyses with varying K, and difference indices between pairs of populations. All four taxa differ considerably in their vertical and horizontal distribution and their ecological adaptation. Coenonympha arcania is a typical Mediterranean species expanding northwards during the postglacial, whereas C. gardetta is an alpine species sensu stricto. Coenonympha darwiniana and C. macromma are two mid-altitude taxa of strictly allopatric distributions most probably performing limited vertical shifts when climatic conditions change. Coenonympha arcania, C. gardetta, and C. macromma are the evolutionary products of subsequent cladogenesis events, whereas C. darwiniana may share a common ancestor with C. gardetta, or represent the product of hybridogenesis between C. gardetta and C. arcania. We recommend species rank for all of these taxa." [Hervorhebung durch E.R.]. PORTER, A. H., SCHNEIDER, R. W. & B. A. PRICE (1995): Wing pattern and allozyme relationships in the Coenonympha arcania group, emphasising the C. gardetta-darwiniana contact area at Bellwald, Switzerland (Lepidoptera, Satyridae).  Nota lepidopterologica 17 (3/4): 155-174 [Digitalisat auf www.archive.org]. 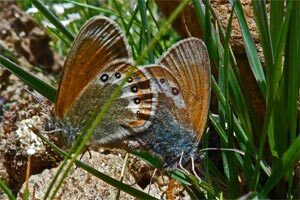 SCHMITT & J. BESOLD (2010): Upslope movements and large scale expansions: the taxonomy and biogeography of the Coenonympha arcania – C. darwiniana – C. gardetta butterfly species complex.  Zoological Journal of the Linnean Society, 159: 890–904. 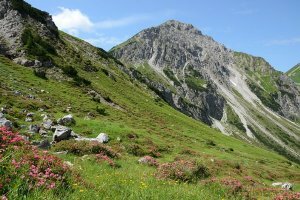 SCHWEIZERISCHER BUND FÜR NATURSCHUTZ [Hrsg.] (1987): Tagfalter und ihre Lebensräume. Arten – Gefährdung – Schutz.  XI + 516 S. (hier 299 und 301-303), Egg/ZH (Fotorotar AG).